Pedro Subijana trained as a student of the Escuela de Hostelería de Luis Irizar in Zarautz and the Escuela de Hostelería in Madrid. In 1975, he opened the restaurant Akelare which has been awarded the highest distinctions in prestigious culinary guides and has three Michelin stars. As a professor, he has taught culinary courses at various American and European institutions as well as in Spanish companies and vocational schools. He also presented the programme La cocina de Pedro Subijana on Euskal Telebista with more than 1,400 shows broadcast since 1992. 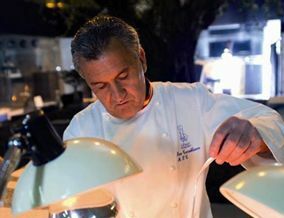 Pedro Subijana is recognised as one of the fathers of the Spanish nouvelle cuisine in his efforts to always do better by acquiring new culinary knowledge and using local and seasonal products. 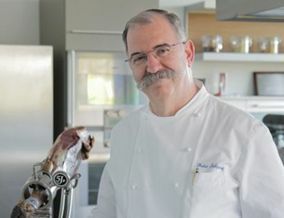 He has created dishes considered milestones in contemporary Spanish cuisine. Some of them are as well-known as Igueldo eggs, sea bass with green peppers, gin and tonic on a plate and distilled lobster. He founded Euro-Toques in 1986 and was named the Chairman in 2003. 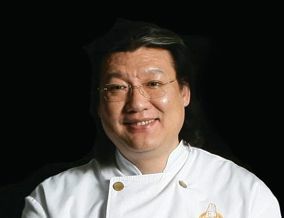 Known as Da Dong- “Dong The Great”, Zhenxiang Dong is considered the most creative chef in China because he has merged the flavours of traditional Chinese cooking with the sophistication of Western nouvelle cuisine. With five restaurants in Peking, one in Shanghai and more than 5,000 employees under him, Da Dong has become a reference in Chinese gastronomy since he opened his first establishment in 1985. Da Dong’s art consists of uniquely combining this great culinary tradition with effervescent creativity and uncommon aesthetic sense. His efforts focus on highlighting the strengths of his culinary tradition: a concern for health and balanced nutrition, the pleasurable flavour of combining ingredients, often unexpectedly, and finally, the aesthetics of his mise en place. He is the Vice-President of the China Master Chef Association and has been awarded with numerous prizes in recognition for his impeccable career. Chef Anatoly Komm is the highest authority on Russian nouvelle cuisine and is practically the only chef known outside his country's borders. His cuisine is known for its 21st century adaptations of the most traditional Russian dishes. He studied physics and worked in finance and fashion before dedicating himself to cooking, representing major Russian textile firms, and that is how he earned enough money to dedicate himself to his vocation. He is also the first Russian cook to receive one of the prized Michelin stars and his restaurant Varvary ("Barbarians") in Moscow entered at number 48 on the most recent Restaurant Magazine world rankings. He opened his restaurant in 2008, which features a colossal dining room on the top two floors of a Moscow skyscraper and lavish tsarist palace style decoration which cost 4 million euros. Internationally known as the tsar of Russian gastronomy, his culinary creations are known for the absolute importance given to the aesthetics of the dishes with greater value placed on the visual and emotional impact than the flavour: “aesthetics first and then flavour", he says. He has declared that this artistic view was inherited from the Italian designers Gianni Versace and Gianfranco Ferré who he personally met when he introduced their designs for the first time ever in Russia after the fall of communism. 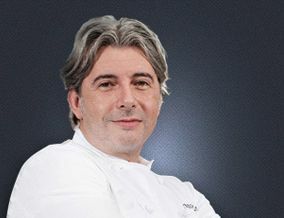 Considered one of the greatest pastry chefs in the world, he was born in Villena in 1951, trained in France and was proclaimed the best pastry chef of the year in Europe in 1990 although he became famous among the general public when he made the wedding cake for the Prince and Princess of Asturias in 2004. Paco Torreblanca’s culinary art goes beyond the pleasure of the flavours. He has been triumphing for more than 20 years with his creative pastry work, which is based on several major pillars: the infinite varieties of chocolate, the Mediterranean’s Marcona almonds, olive oil and the best cane and beet sugar.